Some men have probably wondered how it is possible that the bow tie of the counterpart fits so perfectly to him – even the style and the hold. Because not only the bow tie has to fit the man, also the right strategy to tie the bow tie is necessary. With this tip, you will never have to worry again about whether the bow tie fits properly and at the same time you will be the eye-catcher at any event. The bow tie has already been in the fashion world for centuries - about as long as the tie. Its origin dates to the 17th century, during the reign of the French Emperor Louis XIV., when Croatians visited the royal house. His beloved, Madame Pompadour, was so inspired by the stranger's pretty neckerchiefs that she invented the forerunners of today's bow tie. In the 19th century, bow ties were even more popular than ties, until they were overtaken by the cravats in the following decades. But for some years, however, the bow tie has made, similar to other accessories before, a comeback. They no longer appear old-fashioned, but modern, stylish and young. And they are a perfect complement to the suit. Furthermore, more and more well-known celebrities prefer bow ties to ties, such as Justin Timberlake or George Clooney. Therefore, they are not an outdated accessory for several years by now. When and why a bow tie? In principle, the answer to the “when” is always. However, you have to be much more careful when choosing a bow tie, as its competitor - the tie. Above all, a basic and simple shirt is emphasized by a beautiful, perhaps colored tie and represents style. They are more varied, they radiate personality, they represent the wearer and they also give us a picture of its character. In contrast to tie wearers, bow tie wearers are generally considered as more charismatic and friendly. And on a psychological basis, they subconsciously appear more intelligent. All of these factors are also of particular importance in the business world. Accordingly, bow ties let the wearer stand out from the crowd. 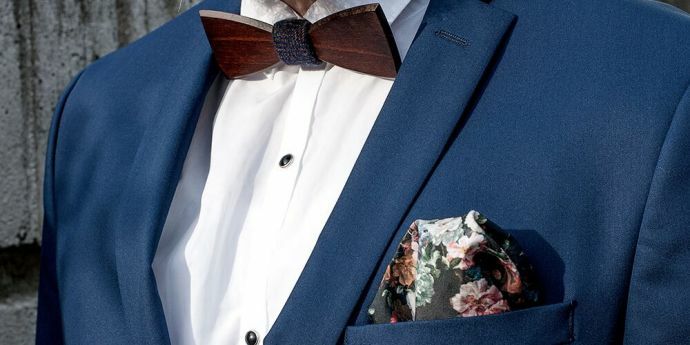 A bow tie has a recognition value and can be worn on all occasions, while a tie almost belongs to a standard nowadays and barely attracts attention. As a result, the individuality of the person gets lost, which is both a pity and avoidable. Especially in business life, it is important to be different from the crowd. You have to attract attention and you have to be remembered. This can also give you a better chance to leave a deep impression on the other person. So why not be brave and wear a small but nice bow tie instead of a long tie? Tying bow ties can be a bit tricky at the beginning. But: practice makes perfect! If it doesn’t work out the first time, try again and don’t be discouraged. The following 7 steps will explain you in detail how to bind a bow tie as quickly and easily as possible. First, you put the bow tie around your neck or collar. One side should be slightly longer than the other. Cross one end over the other so that one of them is on top. Then you pull the overhead end behind the loop upwards along. Now form the front wall of the bow tie with the end hanging down. Next, pull the back end forward over the loop and then hold the formed bow tie to your neck. Now the hard part comes: Form a loop with the overhead, elongated end of the fall and guide it behind the shorter end. At the end, you just have to tighten everything according to your preferences. Finished. Getting up every morning and having to tie a bow tie again and again can be exhausting and stressful. But of course, there is a solution: the ready-to-go bow tie. You just have to tie it around your neck, close the fastening, adjust the size and then the cast-on bow tie is finished. The advantage: Through the spared binding, the accessory always looks good, even if you must hurry up when putting on your clothes. 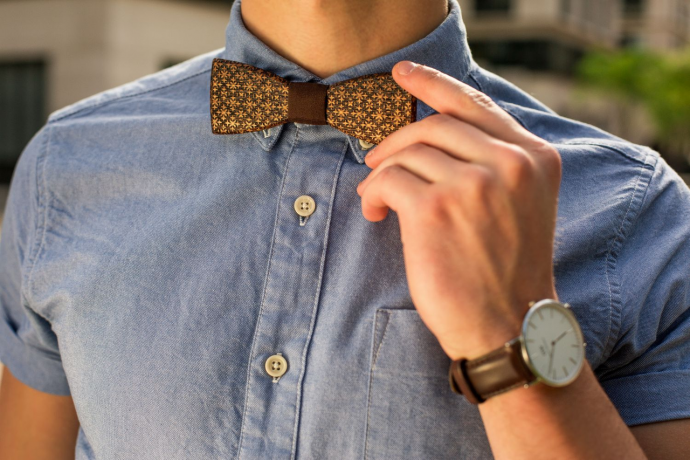 If you want to stand out even more from the crowd, you can also wear something different than a common fabric bow tie. 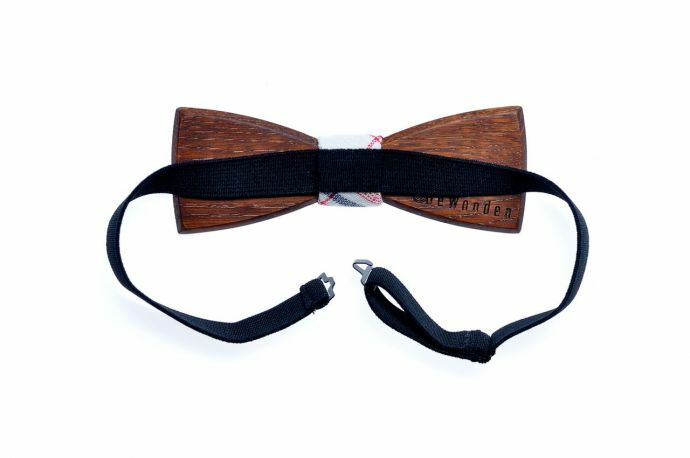 What do you think about a bow tie made of high-quality wood, which is certainly the eye-catcher at every event? On the contrary to mass production, each bow tie is, thanks to its pattern, just as unique as you are. But if you are not sure yet if you would rather wear a tie instead of a bow tie, then look at this article to see if a bow tie or a long tie suits you better: bow tie or tie. And if you decide to wear a tie but don’t know how to tie it, then check out the article on the Double Windsor Knot.